In 1955, the manufacturer of 7-Up took out a full-page ad in the US magazine Ladies’ Home Journal. The ad featured a picture of a baby gleefully swigging on a bottle of the citrus-flavoured soft drink. “For 7-Up is so pure, so wholesome, you can even give it to babies and feel good about it,” the manufacturer claimed. Thankfully, we live in a more enlightened age where food manufacturers can no longer claim their products are “healthy” when they’re not. Or do we? We’ve come a long way since 1955. But one thing hasn’t changed. Food companies continue to spruik products as healthier than they are. We’ve launched our inaugural Bad Taste Food Awards to call them out. A big thanks to all those who sent us their nominations for the worst offenders. Of the thousands of foods lining supermarket shelves, Kellogg’s Nutri-Grain received the most nominations (63) for the Bad Taste Food Awards. What is it about Nutri-Grain that infuriates people? We think it’s Kellogg’s marketing of the cereal as a healthier option – even though it’s more than a quarter sugar. Nutri-Grain is promoted on TV and packaging as “iron man food”, “a source of protein and fibre”, and “fuel and energy for active teens”. 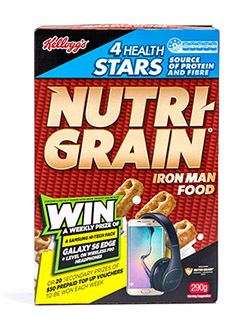 Last year, Kellogg’s reduced Nutri-Grain’s sugar and sodium content, and increased its fibre content, to achieve 4 stars (out of a possible 5) on the health star rating system. Even so, the new formulation still has nearly 3 teaspoons of sugar in every 40g serving. Several contributors wondered how a sugary cereal could get a 4-star health rating. The answer is the health star system considers a food’s overall nutritional value, so positive aspects (such as fibre) can offset negative ones (such as sugar). As we shall see, Kellogg’s isn’t alone when it comes to putting a sporty spin on sugary products. Nestlé claims Milo is “a great nourishing drink that helps kids get the essential vitamins and nutrients they need to take on the day”. To stress this point, the product’s packaging boasts pictures of active young sportspeople as well as a 4-and-a-half star health rating. 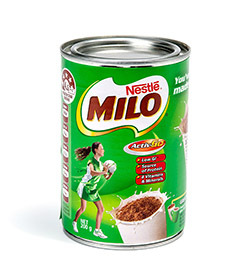 But as well as “8 vitamins and minerals”, Milo contains almost 50% sugar. Surely the bad outweighs the good in this instance? It turns out Nestlé calculated Milo’s health stars on an “as prepared” basis. The high rating is built upon the nutritional benefits of skim milk, which the company says should be mixed with its malty product. So how many stars does Milo get if you rate the powder itself? A miserable 1-and-a-half. 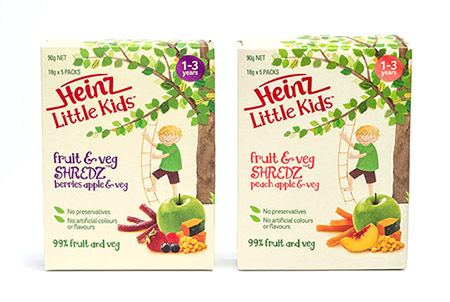 Heinz Little Kids Fruit and Veg Shredz are Kiwi-made strips of paste, puree and juice targeted at toddlers. Heinz has done a fine job of making these rubbery snacks look as healthy as possible. The product’s packaging is emblazoned with images of fresh produce and the words “99% fruit and veg”. On the back of the box, it states “our range of snacks and meals encourages your toddler to independently discover the delicious taste of nutritious food”. But Shredz are nearly 70% sugar, which is hardly an appropriate substitute for fresh fruit and veges. In comparison, a whole apple has approximately 10% sugar. Across the ditch, the Australian Competition and Consumer Commission has taken Heinz to court. It alleges the company made misleading representations about the nutritional value of Shredz. In the bad old days, we drank water and ate oranges when the half-time whistle blew. How did we survive the second half? Thankfully, we now have Gatorade and Powerade to ease our fevered brows. Gatorade says “studies have shown that athletes who hydrate with Gatorade perform better than when they drank just water”. Not to be outdone, Powerade claims “water alone isn’t enough when you are playing intensive or endurance sport”. But make no mistake: sports drinks contain a sizeable sugar hit. 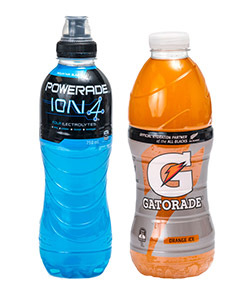 A 1-litre bottle of Gatorade Orange Ice and a 750ml bottle of Powerade ION4 Mountain Blast contain 15 and 11 teaspoons of sugar respectively. Most of us don’t exercise enough to necessitate those extra kilojoules. So go retro next time you head to spin class. Pack water and an orange. When we researched kids’ cereals, we found some had a lower sugar content when compared with previous surveys. But 6 had a higher sugar content. 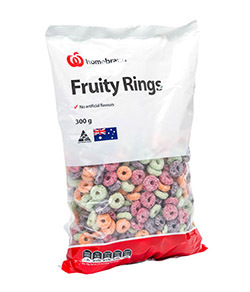 Homebrand Fruity Rings were the worst offenders. The sweet stuff in this cereal has spiked a whopping 30% since 2008. 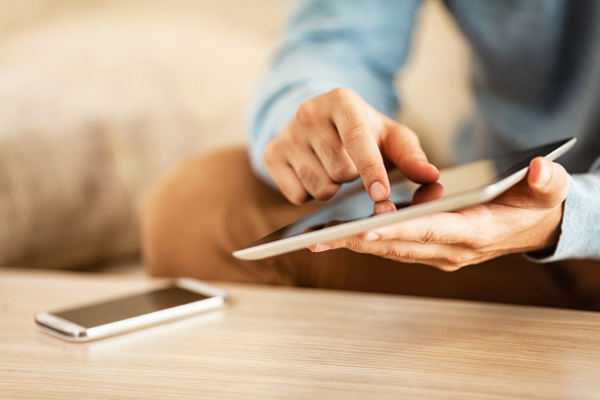 Hot on Homebrand’s heels, Kellogg’s increased the sugar content in Coco Pops Chex and Crispix Honey by 20%. Like Fruity Rings, these products now have more than 2 teaspoons of sugar in a 30g serving. Kellogg’s is also the force behind the sugar daddy of all kids’ cereals: Frosties, which is more than 40% sugar. 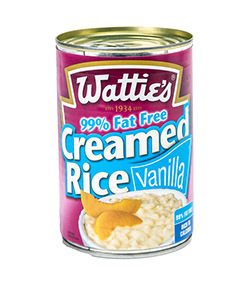 According to Wattie’s website, Original Creamed Rice is 97% fat-free and “a nutritious source of energy, low in fat and high in calcium”. Therefore, a lite version would seem unnecessary. Nevertheless, the company also produces a 99% fat-free formulation of its classic vanilla dessert, which is – surprise, surprise – “a nutritious source of energy, low in fat,” and blah, blah, blah. But while the fat has gone south, the sugar has gone north. There’s an extra teaspoon of sugar (plus some) in each 210g serve of the lite recipe. So you get more sweetness with the lite. 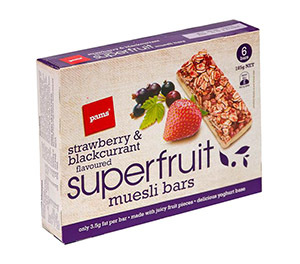 We weren’t sure what to expect when we bought a box of Pams Strawberry and Blackcurrant Flavoured Superfruit Muesli Bars. To us, the word “superfruit” invokes images of fancy-pants goji or açaí berries. But, hey, we were willing to settle for a healthy dollop of strawberries and blackcurrants – like the succulent fruits splashed across the box. Imagine our disappointment when we discovered the “superfruit” content of each bar is limited to 4% strawberry pieces (containing 1% strawberry puree) and 1% blackcurrant juice. Superfruity? Actually the bars are mostly fruit-free. Almond milk has a lot going for it. Among other benefits, it’s low in kilojoules and saturated fats. Unfortunately, some brands of almond milk are also low in almonds. For instance, Sanitarium says So Good Almond Milk Original is “made from the goodness of almonds”. But, in reality, nuts make up only 2.5% of its content. Almonds are third on the ingredients list, behind filtered water and cane sugar (3%). 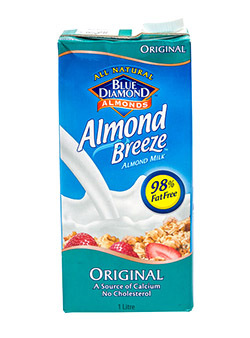 Likewise, Blue Diamond Almonds boasts its Almond Breeze product is 98% fat-free. But it’s also 98% almond-free. So how much nuttiness could you reasonably expect in an almond milk? In the same aisle as Sanitarium’s So Good, we found Pureharvest Activated Almond Milk, which contains 10% almonds. Even better, a standard homemade almond milk (1 part almonds blended with 3 parts water) contains 18% almonds. Keep an eye out for OVI Hydration among the “enhanced” waters in your dairy’s cooler this summer. It’s a mix of water, reconstituted fruit juice, fructose and honey marketed as a healthy option: “natural minerals”, “no artificial preservatives, sweeteners, colours or flavours”, and “antioxidants from green tea”. 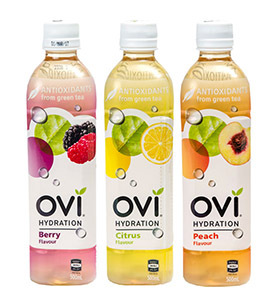 But if you scan the ingredients list, you’ll find OVI Hydration contains only 0.05% green and oolong tea extract. That pales in comparison to the 20g of sugar in each bottle.